This pub was better than I had expected. It is situated fairly close to the sea, but doesn't quite have a sea view (as the address may suggest). There are 2 rooms. The main bar has lots of things to view on the walls, shelves and ceiling. Wainwright & Bombardier were the 2 ales available. First time visit yesterday following recommendations from others. Found it to be a great place, ale was top draw and atmosphere was decent enough. Had heard rumours of this place being a bit of a "locals only" place, but in truth I found the people to be friendly and pleasant. Definately worth a visit again. 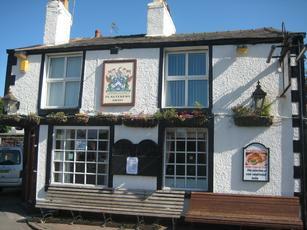 Was in the Hoylake area, and not being a native, consulted the Good Beer Guide, which recommended the Plasterer's Arms. Went in on a busy Easter Sunday, lots of locals at the bar being racuous. Ordered a pint and also just a wee half for my pregnant wife (who couldnt resist the Bombardier) whilst perusing the menu on a chalkboard behind the bar. The barmaid then lifted the drinks up on to the bar, and upon doing so I noticed she had poured two full pints. I said I "only asked for a half, as well as a pint" to which she replied "you've stood there and watched me pour that?" I replied that "I hadnt been watching her" and "I did ask for a half"
I told her "i'd leave it then" and promptly left the establishment with the sound of this barmaid berating me to the very cliquey locals. Absolutely wonderful customer service. Not. It's probably a nice friendly pub if you happen to be a Scouser from Hoylake. If not, i'd avoid. Visited with friends the other night. Had a few pints of Peerless "Hilbre Gold" which was on good form. No opportunity to sample the wares here - doesn't open until 14.00 except on Friday, Saturday, and Sunday when it's 12.00.